Calgary physician Dr. Nalini Singhal works to reduce neonatal deaths in developing nations through the Helping Babies Breathe (HBB) program. We get as much as we give...Learning is never a one-way street, and we learn so much that we do things better at home, too. In July, 2012, Physicians for Peace traveled to Rivers State, Nigeria to provide training to local physicians, nurses, midwives and traditional birth attendants in the Helping Babies Breathe curriculum. More than 170 healthcare providers were trained in four days of training. It’s easy to forget how dangerous the first moment of life can be for newborns in developing nations. “Neonatal deaths around the world had not changed significantly for quite a while, even though childhood deaths had dropped,” explains Dr. Nalini Singhal, a professor in the Department of Pediatrics at the University of Calgary. Helping Babies Breathe (HBB) was the result of that quest. “We looked at what would work with the most limited resources,” says Dr. Singhal, the associate editor of the HBB program. The program launched in June 2010 in Washington DC, by inviting countries from around the world to attend. It has since been adopted in 55 different countries. Dr. Singhal has traveled extensively (including to Uganda and Bangladesh where she is the countries’ technical advisor) sharing the program. So far, the results have been astounding. In fact, a February 2013 publication reported a significant reduction associated with HBB implementation in both early neonatal deaths within 24 hours and rates of fresh stillbirths (FSB) in Tanzania. 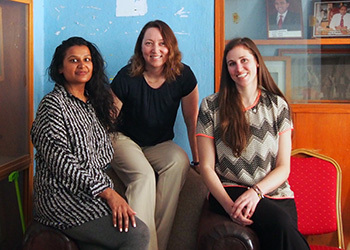 For Dr. Singhal, her involvement in global health has been both rewarding and enlightening. Are you a change agent? If you act as a catalyst for change, you are. Explore some of the AMA’s Many Hands™ volunteer opportunities and find one that helps you make a difference. Many Hands™ is an AMA initiative to celebrate how simple actions can lead to big changes. Learn why we think it's so important and find out how you can inspire others by sharing your story!